PENTON Motorcycles has started a new division called PENTON Recreational Products. It consists of 2 division seperate from motorcycles. 1 for Adults and 1 for Kids. At PENTON Motorcycles we beleive in the future so that means we believe in the youth all across America. So this is the beginning of our kids product lineup. 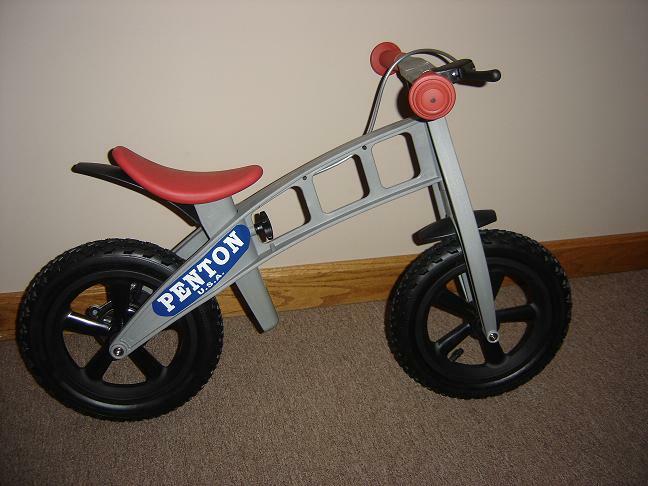 Keeping with the great PENTON name, we know this product will keeps kids happy. PENTON Kids will deliver more products in the near future for "The PENTON Junior Effort". I am trying to get the young kids familiar with the great PENTON name and its fantastic history. This is our second product for kids. The new PENTON First Bike. Designed in Germany. Top German quality. It is a balance bike for ages 1 to 5 years old. Give your kid a head start. They learn balance and motor skills and also a sense of independence. Silver frame with red seat and red grips. Front brake. looks like a mini motocrosser. $145.00 plus shipping. Pure European. Pure Quality. Pure PENTON. Replaceable Pneumatic knobby "Cross Tires" with Schrader valves. Five Spoke composite wheels with smoth spinning bearings. Standard Seat height. 14" to 18"
Adjustable Seat. No tools required.